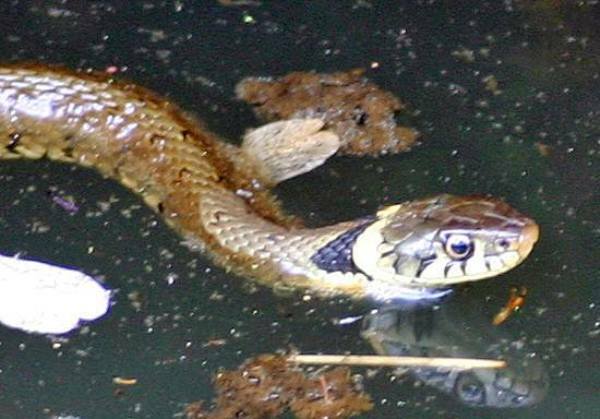 Grass snakes, Britain's largest reptiles, are often found beside ponds, lakes, canals and ditches; they are very good swimmers (which is precisely the meaning of the Latin name natrix). Grass Snakes can grow to well over a metre in length, the Females being much larger than the males, which typically grow to 50cm and have much thinner bodies than their mates. Although colouring is variable and changes during the inter-sloughing periods, Grass Snakes are usually dark green or brown on their upper sides with a distinctive yellow ring or collar behind the head. The underbelly of a Grass Snake is very pale grey with irregular black blotches whose sizes, shapes and positions are often distinctive enough to enable the confident identification of individual specimens. Grass Snakes are common and widely distributed across lowland England and Wales, but they are absent from Ireland and rarely seen in Scotland. On mainland Europe their range extends from central Scandinavia down to southern Italy, while their eastward range extends into the Middle East. 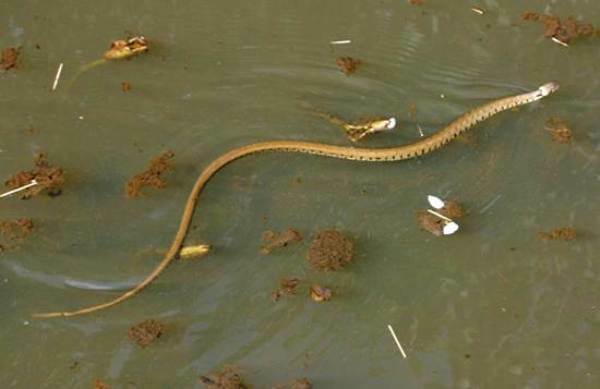 There are also records of this snake occurring in parts of northwest Africa. These very common nonvenomous snakes have a preference for rough land with plenty of long grass, laying their eggs in June and July in rotting vegetation such as compost heaps - a source of warmth. The young hatch in autumn. For food, Grass Snakes eat mainly amphibians, including toads, frogs and newts; and they can even catch small fish. Grass Snakes are sometimes killed by people in the mistaken belief that they are adders. Although they hiss menacingly when cornered, these reptiles are neither venomous nor aggressive, and so killing any of them is quite unjustified; indeed to do so in the UK is a criminal offence under the Wildlife and Countryside Act of 1981.